Welp, yep. If you have read my last journal, so you shouldn't be surprised why am I uploading glitchtale too from now. OMG lelz I luv it! I favorito! omg the photoshop is sooooo good!! my god!! the lighting is so goood! WOAH!!! COOL! 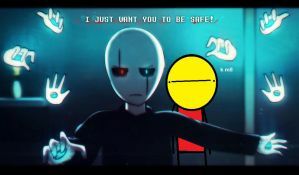 i luv glitchtale! Я писала это в комментах под видео в официальной группе ВК глитчтейла, напишу и здесь. Damn, nice submission there man, as always. Who ? me ? safe from who ? Gaster says "I JUST WANT YOU TO BE SAFE" to Papyrus, who wants to go with Jessica to the town. Is papyrus always need an protection ? Because he is weak ? Jolie: I don't want to fight you! Gaster: I don't want to fight me, Either! The edit seems to be good enough! AMAZING edit, you made it look so dynamic!